We are at the beach this week and even though there was a point when we were trying to pile the toddler, his 55 favorite toys including a full-sized tricycle, me, my 25 kitchen necessities including, apparently, a meat thermometer and the serrated peeler one of you told me about a few weeks ago that I now can’t live without, the beach towels, blankets, umbrellas, sandcastle-shaped bucket, toddler bed bars, a box of groceries and my husband (happy anniversary, baby!) in our little car that we thought we should really just stay home instead, it wasn’t long into our drive onto the North Fork, passing miles of farms, leave-your-money-in-the-box roadside blackberry stands, dilapidated barns, impeccably kept houses, and more grape vines than you could count in your lifetime that we were unwaveringly certain we were back where we were meant to be. It’s so quiet here that the days feel longer, virtually distraction-free. We’ve been beaching in the morning, adventuring with the toddler in the afternoons and cooking up a storm for dinner each night. We had a mash-up of Molly’s Dry-Rubbed Ribs and Harold McGee’s Oven Ribs (that I really have to reassemble here one day, with some streamlining) one night (with corn and an heirloom caprese), and last night, we had a tiny dinner party with friends that are in town with sugar steaks (a recipe I’ve only been promising you for a year), a crunchy Greek salad and this old favorite potato salad. Are you around? You should come over for dinner. We tend to make too much. I didn’t make this flatbread here but it would fit in perfectly would I want to repeat this dinner from last week. About a month ago, I saw the chard lined up next to the corn and leeks at a farm stand and couldn’t get the combination out of my head. It was the most mid-summery combination I could imagine and I debated assembling the three into a galette (but wasn’t in the mood for a buttery crust; am I broken? ), pizza (but it would require more cheese than I thought necessary; ditto, broken?) and finally just decided to call it flatbread, though we’re still going to just use a pizza dough. So to make this as unnecessarily confusing as possible. These three ingredients cooked together play off each other fantastically; the leeks get deep and sweet; the chard wilts but retains its bulk and the corn kernels crunch across the top. I scattered the top with soft goat cheese, but you could just as easily soften it and spread it thinly under the ingredients, as we did here. Whatever you do, I implore you to make this before the endless piles of summer corn are a distant memory. I tend to make things with small yields that are easily scaled up, but this will yield two big flatbreads. (We find that one feeds the three of us for a light dinner, unless the toddler has an unusually large appetite. Then things get ugly.) Honestly, I was trying to scale the recipe to the size these vegetables are typically sold in. (I.e. Wouldn’t half an ear of corn be an annoying amount?) Nevertheless, you can of course half this recipe, but the good news is, if you don’t, we found this reheated really nicely for a second dinner. We ate it with a tomato salad, and one of the nights, we had some leftover chicken, too. Should you have a grill at your disposal, I think this would make an unbelievable grilled flatbread. Here’s how: Prepare your filling and set it aside. Roll or stretch out your doughs. Get your grill going at a high temperature and brush the grates with oil. Throw the first raw dough down right on them. After a few minutes, it will be black and blistered underneath. Flip it off the grill, landing it ungrilled (top) side down on a platter. Spread half the filling over it and slide it back on the grill for 5 to 7 minutes with the top down, until charred slightly at the edges. Repeat with remaining filling and dough. Invite me over. Because this tends to irk me in other recipes, it’s only fair that I warn you that the toppings will not glue to the flatbread. To do so would require a lot of melty cheese or wetter ingredients and really, this is delightful with neither. You can pick up squares with your hand (but no handsprings, okay?) or eat them with knife and fork. The flavors taste like they were always meant to be together, and if you’re me, you’ll miss it long after you’ve finished your leftovers. Trim the ends off your leeks and halve them lengthwise. Cut them crosswise into 1/2-inch half-rings. 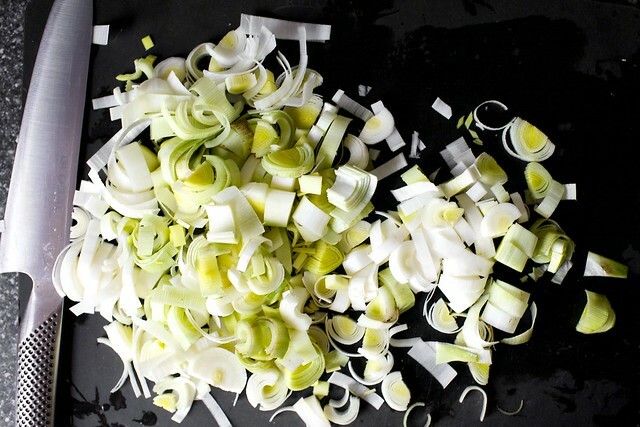 Fill a medium bowl with very cold water and drop in sliced leeks. Swish them around with your fingers, letting any sandy dirt fall to the bottom. Scoop out the leeks and drain them briefly on a towel, but no need to get them fully dry. Do the same with your chard ribbons, but you can leave the leaves on towels until they’re nearly fully dry, while you cook the leeks. Heat your oven to 450 degrees. Heat a large, heavy skillet over medium heat. Once hot, add butter and oil and once they’re fully melted and a bit sizzly, add the leek slices. Reduce heat to low, cover with a lid and cook leek for 10 to 13 minutes, stirring occasionally. Raise heat back to medium, add the chard ribbons and cook until they wilt, about 4 minutes. Season mixture with salt and freshly ground black pepper, adding more if needed. 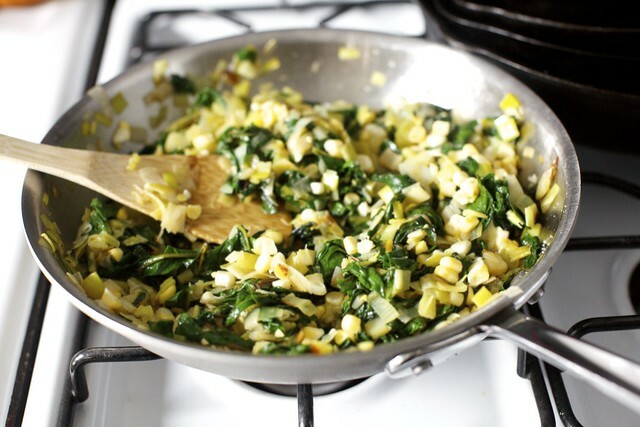 Finally, add your corn kernels, cooking them with the leeks and chard for just another minute. Sprinkle two baking sheets with cornmeal. If you have pesky old baking trays like I do, and your breads really like to stick to them, I find things will release more reliably if you first lightly spray them with an oil before sprinkling on the cornmeal. Roll or stretch half your dough into a rectangular-ish shape (flatbreads are prettiest when they’re irregularly shaped, in my humble opinion) and arrange it on the prepared sheet. Spread half the leek-corn-chard mixture on it. Sprinkle it with half the log of goat cheese, crumbled into small bits. Bake flatbread in oven for 10 to 15 minutes, until the edges of the bread begin to brown slightly (they might brown more deeply in a better oven than they did in my lousy one). Repeat with remaining dough, filling and goat cheese. 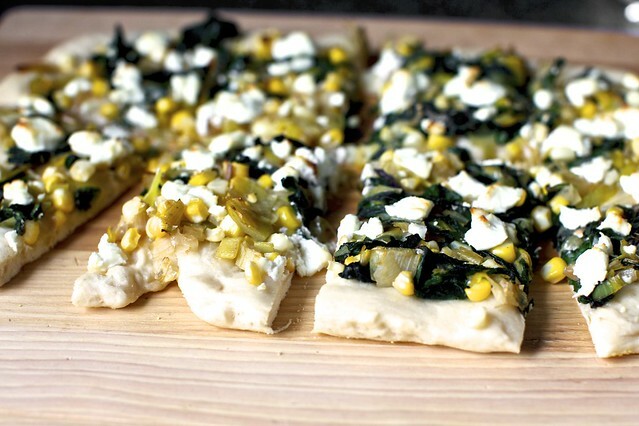 To serve, slide each flatbread onto a cutting board and cut into 8 rectangles. Serve immediately. I love all these toppings! Might just add a bit of the mature cheddar I just brought back from Lyme Regis. Beach time sounds lovely- and yes, I can come over for dinner! This flatbread looks wonderful. Looks great! Thanks for the great idea for using corn that goes beyond just eating off the cob. Definately on tap for this weekend. I wonder if I can use Kale? And I’m growning rainbow Chard in the back garden wondering WHAT ON EARTH will I do with it! Now I know. Thanks again Deb. I read the title was was about to write it off since I don’t like cornbread… but OMG I LOVE this idea. I best it would be great with some smokey tempeh bacon or chorizo added too. I also have a confession. I may check Amazon.com at least once a week, just to make sure that, by some weird miracle, your cookbook hasn’t magically decided to come a week early. Most anticipated purchase of the year! Such a fantastic combination. 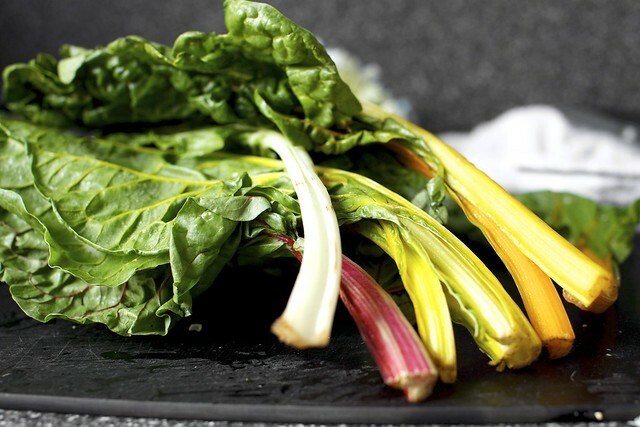 Don’t you just love the colors of the chard? That looks great! Hooray for Fruit Stand Chic! I love love love summers on Smitten Kitchen. That looks so delicious! I’ve never known what to do with swiss chard either. I’ve admired from afar the beautifully colored stems. I’ve watched the deep green leaves practically wave at me at the super market but couldn’t quite work up the nerve to try them out. Today I think I found the receipe that will take me out of my swiss-chard-wall-flower status. This looks wonderful! Do you think it would work with kale instead of chard? We have been getting an overabundance of kale from our CSA, and I’m wondering if this is the solution to that problem. I really like this flatbread but I can’t wait for you to post the sugar steaks recipe…it sounds so incredibly delicious! I am RUSHING to the store to get stuff to make this. RUSHING. Omg. The bf and I went out for a run this morning and talked about trying leeks! Neither of us had but I think we’d love them. 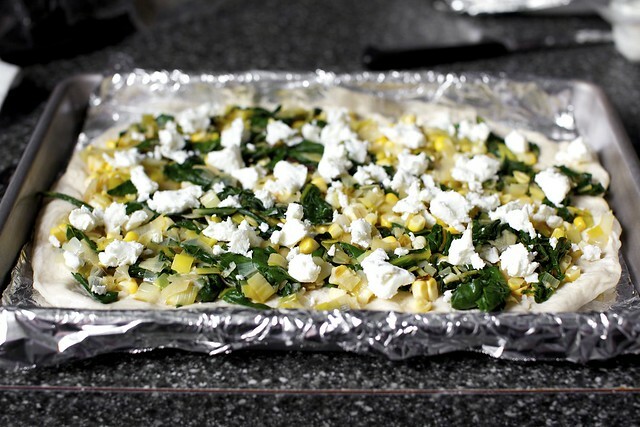 Corn pizza, vacation stories, toddler on vacation stories (even better!) – sounds like you’re have a great time. And beautiful pizza! That looks AMAZING! Summer as a slice. :) Definitely going to have this for dinner soon!! But actually.. I’m commenting to say that there should be a ‘six years ago’… SIX years! Congratulations!!!! Glad to hear you’re having a lovely time at the beach; vacation wouldn’t be a vacation without plenty of relaxation and good food! 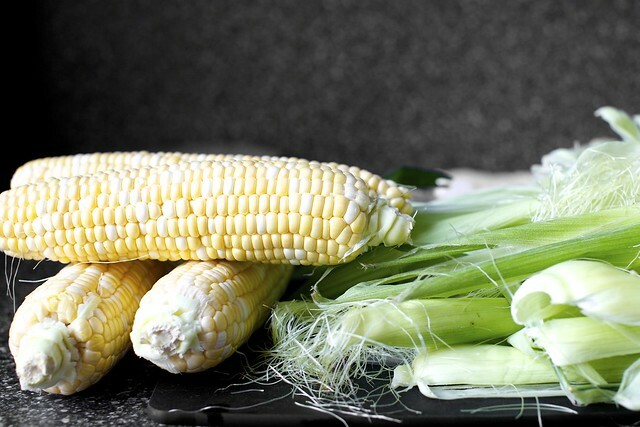 I just got some of the best corn I’ve had all summer and, although it pairs so well with just a smidgin of butter and salt, I think I could come around to the idea that it could go just as well with chard and leeks. Talk about freshness!! 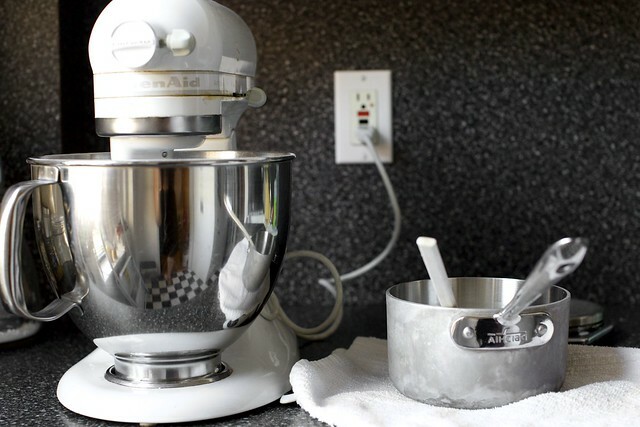 Isn’t it funny how we become attached to our “toys?” When I went to a family get together this summer, I knew I would be doing a lot of cooking, so could I be parted with my KitchenAid? Would this work with a dough for Crisp Rosemary Flatbread, as well as a standard pizza dough? i am a summer corn-aholic. i have been roasting it on the grill (when possible) but more commonly in tinfoil with butter in the oven. it gets so delicious- soft but not too soft. yum yum. This looks amazing! I’ve been making your Bacon Corn Hash and it is become the kids’ favorite this summer, but I think this flatbread is going on the weekends’ menu! Yum! I’ve made a very similar recipe to this before, except I considered it a sort of cheat’s pizza. I threw some tzaziki on as well while eating it and I loved the extra yoghurt flavour. OMG! Hubs just perfected grilled pizza (after sporadic attempts all summer)! He’ll love to grill this if I make the topping ;) Thanks for sharing! Absolutely love the inclusion of summer corn. I am always looking for new uses, especially when it can retain some of its natural crunch. Great idea! Deb – you are The. Queen. of run-on sentences and I soooo respect you for that. I hope someday to be able to live up to your shadow of that skill for I try soooo hard. :) Okay not really, just wanted to compliment you on your craft. And on an unrelated note – the flatbread looks ridiculous. Ly incredible. Happy Family Beach Time! this really couldn’t sound any yummier – flatbreads are the new black! Look great, I like absolutely anything with leeks and I would probably try it with Roquefort cheese… or maybe it would be too strong ? Once again it just looks so delicious!! Have a great holiday and make the most of it. Vacation food always tastes so, so good! This is such a fantastic combination of flavors. Looking forward to trying it on the grill! After the initial confusion (chard?) and the help of google, (we know it here as silverbeet, and there is heaps in my garden!) I will be making this as soon as possible, which might be awhile as its winter! And using fresh ingredients is soo much nicer! Might have to try a substitution for the corn in the meantime as it looks so delicious! I would have never thought of this combination! Someone just gave me a pizza stone. This recipe might be the perfect excuse to try it out. By the way, I adore Greek salad but have some weird mental block about making it myself. I know, I know. But could you think about posting a recipe sometime, or at least for Greek dressing, one of the tastiest things in the world? I make salads all the time. Greek salad, suddenly I need rules. Such a fun dinner! Yum! This veg combo speaks to my soul…. PS Just pre-ordered the cookbook and cannot wait. I was going to grill pizza over the weekend and failed to make that critical leap of thinking and put the toppings on after the crust had mostly cooked. We ended up using oiled foil, which worked, but I want to try this next time. I must admit, I would have never thought to put these all together, but I am loving the idea of this combo. Thanks! Made this tonight and it was amazing. Thanks! MMM – I just made a hash of garden grown potatoes and chard with some farm stand corn thrown in and feta tonight for supper. On a flatbread with some leeks sounds excellent. Oh, and don’t worry, you’re not the only one who always has to take pretty much the whole house on vacations, same here! 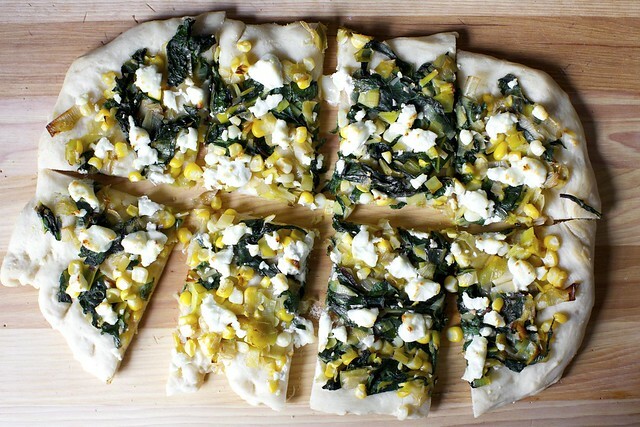 What a great combo, I love corn on pizza – well in your case flat bread. It is making me look forward to summer. Leeks, corn and chard. Yeah, yeah – inspired. Yummy sufft. Sounds great, gotta try it. But really why I posted is that shiny KitchenAid bowl. Love, love. LOVE the reflection of your wonderful checkerboard floor in that shiny bowl. That shot moves into my 15 favorite Smitten-photos. I love my work-horse K5A. It has never let me down, but sadly no kitchen reflections in its brushed surface. Yum! That looks like just the thing to have in the heat of summer, since you almost make a pizza look like a health food! I think that this would be great with an avocado salad or some roasted garlic sauce as well. Deb you are a genius! I’ve made corn with leeks and chard a couple of times as a side but would never have thought of piling it on a pizza base for a main. This looks like a great ‘accidental vegetarian’ meal for my meat-loving husband. Thanks! This dish looks more colorful, by adding more vegetables in any dish the taste will be awesome. Will try to prepare this dish for my family. This is the freshest and most nutritious flatbread I have ever seen! You get an award for coolest ingredients with the leek and chard – this sounds delightful! And the goat cheese! MMMMMM! I’ve been playing with making pizzas on the grill…this lovely creation is now next in the queue. Looks great & sounds wonderful. Corn was on special yesterday and I remember seeing some rainbow chard too. Will run back to get some. If it doesn’t rain, will do on the grill. Lots of fiber and goodness! Yummy. I just had to drop in for a minute and throw kudos your way – not only for this recipe but for many others I’ve tried in the past and failed to tell you how good they were! I appreciate the vegetarian selections and have successfully served them at my dinner table! Thank you so much for such a lovely site, beautiful pictures and delish recipes! Oh, yum, yum, yum!!! This looks so good. This looks great and I totally agree, the combination of veggies sounds superb. O)n a side note: Oh my goodness–that definitely seems like a LOT to pack for a week. Glad you are getting in some relaxation and fun beach time though! I’m sorry, but half a picture of the wee one doesn’t cut it. Particularly half of a cute drinking from a straw picture. And, of course, the food looks delicious. Does goat cheese always mean feta? I’ve tried to like feta cheese, but it always tastes yukky. I haven’t ventured too much into the world of chesse – American, Mozzarella, Cheddar and the stuff in the shaker from Kraft are all I’ve ever needed. I look at all the fancy cheeses available, but don’t know what to do with them. What’s your suggestion for a feta substitute? I’m willing to try to move beyond cheddar, but I’m overwhelmed at the cheese counter. Your blog is great. All the recipes I’ve tried have turned out beautifully. The newest brownie recipe was a big hit at work on Monday! Banana crepes on the schedule AGAIN for this weekend. 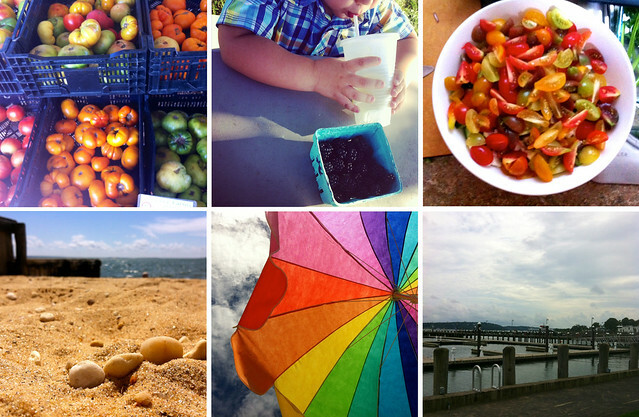 Have you taken the toddler to Harbes Farm Stand? Things to climb and play on and really good roast corn. jwg — Yes! That’s where that lemonade he’s slurping on is from. We took corn home and grilled it; it was life changing. Connie — Actually, most feta is cow or sheep’s milk. Chevre, the soft log I’m suggesting here, is from goat’s milk. No need to use it if you find it “yucky.” You can substitute a cheese you’d prefer. Taste it if you can — Blue cheese could be great. Not sure if I’d use Roquefort for baking but that’s just me; it’s so delicate and rich and expensive, I like to buy small pieces and use them exclusively for snacking or raw in salads. Katherine — Use any that you like. I used a soft log of chevre. Kathryn — The crisp flatbread isn’t great for baking things on top. It’s more of a cracker; it doesn’t handle heavy toppings well. We’re looking for a soft, yeasted flatbread here. Margherita — You’re right, I shouldn’t. I technically don’t have space for a crowd. But still, it sounds like it would be SO MUCH FUN if a surprise dinner party swarm arrived. It’s been far too long since I’ve eaten something with leek. I should remedy this asap and also I have to find a way to convince my boyfriend to try it :)) It’s gonna be a challenge! Have you tried this with chevre ? Everything looks gorgeous and delicious! Btw, I’m having a total duh moment here (these come frequently these days) where I realize that I neither did nor suggested that you brush the flatbread dough (or at minimum, the edges) lightly with olive oil before adding the toppings would lead to a more golden, glistening flatbread. I also think a small sprinkling of chopped fresh thyme on top of the dough before adding the toppings would taste wonderful with the other ingredients. This looks yummy! It remined me of a corn pie my Mom used to make when I was a kid in Lancaster County. And, I am SO with you on the serrated peeler. I haven’t picked up my old peeler since I brought the new one home! Whoever would have thought you could PEEL A TOMATO without boiling a pot of water? I haven’t tried it on a peach yet, but I but it would work flawlessly. Hi Deb..the peaches at Sang Lee are usually from Briermere, and are great.. We are very lucky that unlike many parts of the country we have not had a drought and the tomatoes, and corn and fruits are particularly luscious this year..enjoy them all. Your little guy looks like he is thriving too..completely delicious as well. Why is there music? Make it stop!!! Yum, that flat bread looks amazingly delicious. I’ll have to try it. looks delicious! I love leek and chard. In Germany we call those flat breads “Flammkuchen” originally prepared with sour cream, onions and bacon. I like your vegetarian alternative. Hi Deb, I may have suggested the serrated peeler and am so glad you’re loving it. Life changing. You probably already do this but this same veggie combo is as good in a frittata (last night in my house) as it is in a fritter! Enjoy vaca. I love all this summer corn everywhere! Thanks for this great idea. Healthy and tasty. This recipe was referenced on the Washington Post food chat yesterday. I thought you’d like to know how widespread your fame is. I seriously can’t wait to make this! What a great combination. We’ve been doing lots of flatbread/pizza things on the grill lately, so that’s where I’ll likely cook it. Summer Pizza. 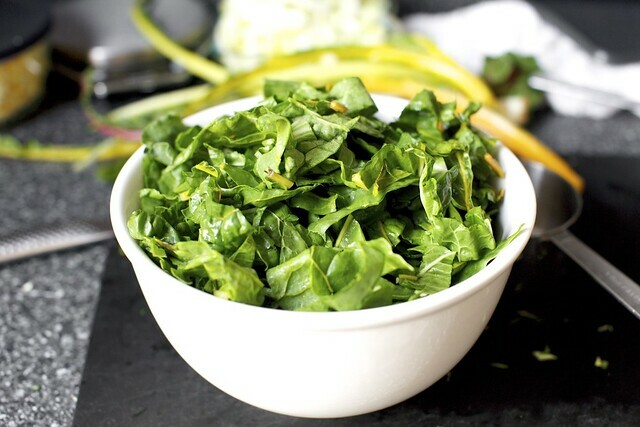 What a delicious way to get your greens! This looks incredible, I can’t wait to try it, though maybe with some caramelized onions too! I took inspiration from your simple strawberry tart (quite awhile back) and made one with blackberries and a bit of lemon curd spread under the pastry cream. Delicious! I made this for supper tonight using corn and kale I got in my CSA basket. Wasn’t too sure how the kale would be – I sauted it a little longer, about 6 minutes with the leeks. I also made some “traditional” pizzas (tomato sauce, mozarella, etc) for the kids. My husband surprised himself by liking the “kale-one” better! It was really tasty and the kale crisped up in the oven adding a great textural contrast. Keep ’em coming! What an inspired combination of vegetables! Looks simply delicious! I didn’t have goat cheese so I used gruyere, sprinkled on in chunks halfway through baking. The flavors blended and mellowed beautifully. Why must everyone opine before trying the recipe? Holy Cow!! amazing! Making it as we speak and just tried the filling by itself while the flatbread is on the grill! I think I make make just the filling as a side in the future, it’s that good! Made this last night. Really an incredible recipe. Added a bit of garlic and mozzarella. Amazing – and beautiful too! Looking forward to more pizza recipes! This was absolutely delicious! I didn’t bake my flatbread from dough, but used a flat bread instead. I also added some turkey sausage pieces. We topped it off with sriracha and it was phenomenal! Rave reviews! I made this for dinner tonight, it was delicious! Thank you so much for the recipe, I’ll be making it again for sure. can’t wait to try this, flatbreads are my favorite! Made this tonight, and loved it. I added a few sage leaves at the end of cooking, and used a Parmesan like hard cheese instead of goat cheese. I also used a pre baked naan. While it was baking, I was thinking this would make a good filling for a corn tortilla; then I ate it and damn, it was good on the naan. Can’t wait for leftovers for lunch tomorrow, and making my coworkers jealous. Made this last night…it was delicious! Made the bacon corn hash tonight. Again, absolutely wonderful. Thank you for helping me get more confident in the kitchen. What a great recipe…Friday night is usually pizza night here. I have my standard crust that I love but wanted to make your recipe as written so used your dough recipe. It was a great switch-up on pizza night. I found the red swiss chard and it tinted my leeks a bit pink…very fun! Only thing I changed was the cheese as I was out of goat cheese. Had some Mexican queso and it was really good. Thanks for expanding my horizons yet again. I made this and your most recent brownie recipe last night and they were both perfect! I added a bit of bacon on the flatbreads, but I don’t think they even needed it- the earthy flavor of the vegetables is enough. PS- First time commenter, LONG time reader and baker. Thank you for providing me with dozens of my most fantastic dishes and treats. Good God, your photos are FANTASTIC. How can a simple cut up eggplant look so amazing!! Gosh, I’ve signed up to this blog. Super. This was incredible. We made it with chicken on whole wheat crust and it was to die for. Thanks! Just thought you should know a gal in Oakland made this tonight, with possibly the last leek on Earth. Crackin banana bread awaits me in the morning. Thank you, ’twas delish! I love this! I made it last week and my husband and I just devoured it in one sitting. I’m making it again right now a bit more of my own spin: I made a whole wheat pizza dough with some dried basil mixed in and I’m going to sprinkle a little paprika over the top just before I pop it in the oven. I made this topping and used it to fill your empanada dough, and it was divine. Should you ever need vegetarian empanadas, know that you already have the most perfect tools at your disposal. Thanks again for a delightful inspiration. stella — Such a great suggestion, thank you. Ive been eyeing this recipe for months now and with the last bit of summer it has been moved to the top of my list. Has anyone made it with fresh ricotta instead of goat cheese? I don’t know if the flavor would be too mild or would add a similar creamy texture. Hi Meredith — Although I prefer the tang of goat cheese here, I think ricotta would work, but I might dollop it on the second it comes out of the oven, rather than baking the ricotta; I prefer the ricotta texture unbaked. This worked really nicely tonight. I loved the combination of chard and corn and don’t think I’ve used those together before, but we have a glut of chard going on now in the garden, and I was so grateful to make it into something my family would eat tonight. Thank you. Meredith, I just made this today with fresh ricotta! (And corn frozen from last summer.) It was delicious. I dolloped it onto the dough underneath the other toppings, so it stayed nice and soft instead of drying out on top, which I thought was a very nice texture. Deb, thanks for everything you do! At least 85% of the recipes I make at home (and 95% of the recipes I recommend to CSA customers) come from you. I made this for a party this weekend and it was a huge hit! I love when the flavors of veggies speak for themselves. I will definitely be making this again! I used the lazy pizza dough recipe that you have associated with your margherita pizza recipe (I made the full recipe’s worth of dough) for this and it worked great! Super tasty, and my one year old loved it. This was the perfect late-summer recipe for our CSA. I made this filling but didn’t make the pizza crust; the filling is itself amazing and I found so many other uses for it besides pizza (I put some on an existing cauliflower crust cheese pizza). I made omelets with it and tossed in some feta (so good). You’re right about the three ingredients being a perfect combination–thank you for all your inspiration!